Colin Briggs scored three goals and assisted another to help the No. 1 Virginia Cavaliers (5-0) top the No. 3 Syracuse Orange (2-1) on Sunday evening, 14-10, in front of 5,855 fans inside Klöckner Stadium. 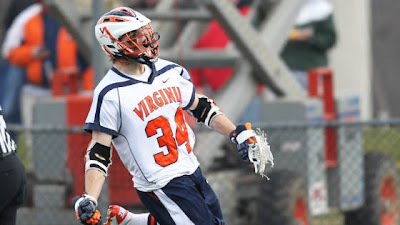 UVa now owns a 15-13 record all-time against the Orange and the four-goal win serves as the largest margin of victory by either team in the series since the Cavaliers won 17-10 in the 2006 NCAA Semifinal round. "We seemed like a team that was very tight in the first half," said Virginia head coach Dom Starsia. "I always thought we were playing hard, but we turned the ball over so much and had some unforced errors in the second quarter. Syracuse was good enough to turn those into goals against us.